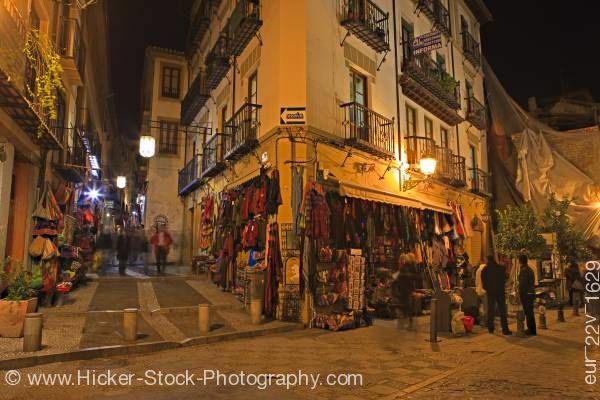 This stock photo shows the souvenir shops lining Calle Caldereria Nueva at night in the City of Granada, Province of Granada, Andalusia (Andalucia), Spain, Europe. A lovely evening with the glow of the street lights adds to the ambiance for the shoppers. This stock photo shows the open view of the souvenir shops lining Calle Caldereria Nueva at night in the City of Granada, Province of Granada, Andalusia (Andalucia), Spain, Europe. Beautiful night time scene of the store fronts of the Calle Caldereria Nueva. Many people walk and browse among the items for sale in the souvenir shops and along the stone street. The corner building is three stories with black iron guard rails in front of the glass doors. The first floor is the open display of the store. Many items are hung around the store for display. The lamp posts lights add a golden glow to the evening. On the side of the shop a lighted walkway leads to other buildings in the distance. Souvenir Shops lining Calle Caldereria Nueva at night in the City of Granada, Province of Granada, Andalusia (Andalucia), Spain, Europe.